What is it like to live as a Christian in the UK in 2018? 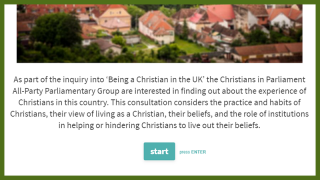 The All-Party Parliamentary Group, Christians in Parliament are running an inquiry into ‘Being a Christian in the UK Today’ and want to hear from you. Any Christian living in the UK can respond to the consultation (responses can be completely anonymous) and there is scope for organisations, churches and individuals like you to respond. Please be aware that the consultation closes on 16 December. Don't miss your chance to respond. Click through to the form using the orange 'Respond to the consultation' button below. some of our cases in your response. Do Christians make a positive contribution to UK society? How free do you feel to share your Christian beliefs with non-Christians? Do you perceive there to be any barriers to Christians engaging in public life? Are you aware of any Christians who have experienced hate crimes or incidents because of their faith? Over the last ten years has it got easier or harder for Christians in the UK to live out their faith or speak about their beliefs? You could use information from our recent news release about Richard, a Christian magistrate who was dismissed by the Lord Chancellor and the Lord Chief Justice after expressing his view that it is in a child’s best interests to be raised by a mother and a father. He lost his case in the Employment Tribunal, but has just won the right to appeal this decision. You could use details from our article on Felix's case, a Christian student expelled from university for expressing his Christian beliefs about marriage and sexual ethics on Facebook. You could talk about Joshua's case, a Christian maths teacher who was disciplined for ‘misgendering’ a pupil. You could write about David, a Christian doctor whose work on behalf of the Department of Work and Pensions was terminated because of his belief that gender is biological. You could speak about Mike, a Christian street preacher who was arrested for his expression of Christian beliefs on the streets. You may want to talk about Vicky, a Christian teaching assistant who was disciplined for expressing her Christian beliefs about sexual ethics when responding to questions from a pupil. You might reference the case of Victoria, a Christian NHS therapist who was disciplined for sharing her faith with a Muslim colleague.